Today's post is a step away from my normal beauty ramblings. However it is something important to me and I feel a need to share with you - I hope you will stick around to read this post. Above is a photo of my older brother Jake and myself. Jake will turn 26 this year. He had uncontrolled epilepsy and has since he was 6 years old. Jake contracted encephalitis when he was 4, it is an infection of the brain (similar to meningitis which is an infection of the fluid around the brain). Jake spent around 6 weeks in the Royal Children's Hospital Melbourne. Much of that time was spent unconscious and to be honest it was lucky that he survived. Due to the scaring the encephalitis left on his brain he has had epilepsy since then. Jake's epilepsy is not controlled. This means he still has seizures even though he is on medication and has a vagus nerve implant. He can go around a week without a seizure or he can have 20 in a day. There is no way of predicting when he will have a seizure or what type it will be. A seizure is a little difficult to describe as the seizure everyone has differs. It usually involves loss of control of body movement and often a loss of consciousness A seizure can last for anywhere between 30 seconds to more than 5 minutes. Epilepsy can make life difficult as Jake's is uncontrolled it can be dangerous for him to be left completely alone. He could just drop and have a seizure anywhere (and I mean anywhere). Injuries from falling when suffering a seizure are very common for epilepsy sufferers - Jake fell when he had a seizure on Sunday, he now requires surgery to fix it. Epilepsy also limits what he can do - he can't have a normal job and he can't drive (something that makes him very annoyed). Luckily we live in a supportive environment and there are some opportunities for him. At this stage there is no cure to Jake's epilepsy. He is not a candidate for traditional brain surgery as he doesn't just have one area on the brain that is scarred - it is multiple places. Numerous medications have been tried and some have helped but not cured (some have also had some terrifying consequences too). For now, we as a family hope for something new and miraculous to be created. There is some hope with a new treatment called 'deep brain simulation' that has had some promising results. However it is not available to Jake at this time. Fingers crossed for the future though! I haven't written this post to tell you that you should donate money to Epilepsy Australia (though that would be great if you did). I have written it to help fulfil the aim of Purple Day - increase awareness of epilepsy. A seizure is something many people are frightened, don't understand or just don't know what to do when they see one. Seizures can be confusing to see - a lot of the time it just looks like the person is on drugs or is drunk. I want you to have some understanding of epilepsy so if the need arises you would know how to help someone. The above first aid poster is a great resource (click on it to enlarge it). 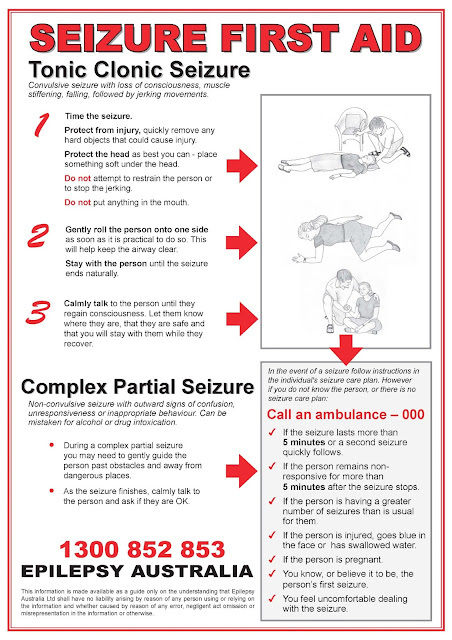 Do not panic when you see someone having a seizure - in the case of my brother, he can sense the panic and it then panics him. Do not ever point, laugh or stare when you see someone having a seizure. I have seen this too many times - Jake regularly seizures in shopping centres and the attitudes of some people make me so mad. This type of attitude also makes the person having the seizure feel embarrassed. If you are comfortable, feel welcome to offer your help or ask if everything is alright. More often than not you will be thanked and told 'it is just a seizure, they will be fine in a little while'. Thank you for reading this post - it means a lot to me. If you have any questions feel free to ask below. 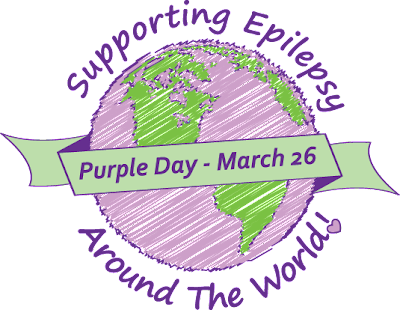 For more information you can head to the Epilepsy Foundation of Victoria's website (or do a quick Google search to find your states/countries organisation). Beautiful post Stephanie. I knew some facts about epilepsy but you've informed me of so many more. I hope your brother is doing well and that his surgery goes well too. Please update us.